Nashville, TN (August 17, 2018) – GRAMMY® Award-winning recording artist Donald Lawrence commands attention on his latest song with The Tri-City Singers, “He Heard My Cry” (feat. Sir the Baptist and Arnetta Murrill-Crooms). Creating an urgent call of deliverance driven by Lawrence and the featured voices of hip hop lyricist Sir the Baptist, the chorus of The Tri-City Singers and soloist Arnetta Murrill-Crooms, “He Heard My Cry” is the second single in the upcoming reunion album from Lawrence with the original Tri-City Singers, celebrating their 25th anniversary. 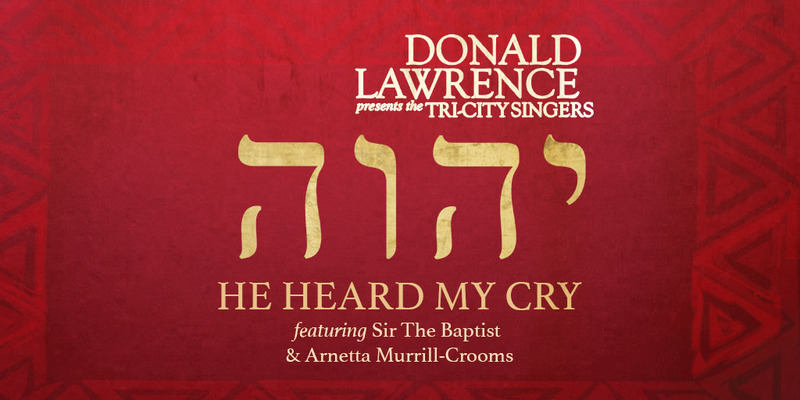 Donald Lawrence Presents The Tri-City Singers: “He Heard My Cry” (feat. Sir the Baptist and Arnetta Murrill-Crooms) is available everywhere now.